Set of Heroic Expeditions "Path of Heroes"
Soon a new set of Maps will be available: “Path of Heroes”. They are Heroic Expeditions where you will replay old expeditions. Your tasks will include locating a Horn and a cave. Playing the horn will open the cavern. Also it is added new strong enemies like the Anaconda in Snake Marsh. 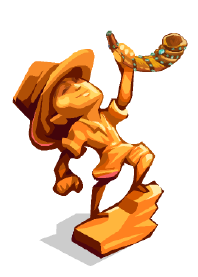 To blow the horn the player will need to ask some items, but it is really not much this time, we will need one “Heroic Pose” and two “Heroic Music” for each horn. The first four heroic maps will be: Snake Marsh, Jungle Run, Mountain Pass, and Danger Mine. Others possible will follow: Poachers Problems and Safari Showdown. Adventure World: Tibet is Here!